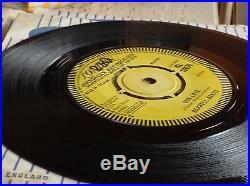 I HAVE BOUGHT ONE OF THE BEST COLLECTION OF PROMOS / DEMOS / ACETATES FROM A RETIRED RECORD COMPANY EXECUTIVE THAT WORKED IN THE MUSIC INDUSTRY FROM THE LATE 1950’S TO THE MID 1970’S, THIS IS ONE OF THE MOST AMAZING COLLECTION OF SINGLES I HAVE EVER SEEN AND I WILL BE LISTING IT OVER THE NEXT FEW MONTHS, THERE ARE MANY NEVER SEEN, OR RARELY SEEN PROG / PSYCH / FREAKBEAT / MOD / BEAT / DANCER / NORTHERN SOUL / ROCK’N’ ROLL / POPCORN / FOLK DEMOS / PROMOS AND ACETATES!!! AND ALL IN AMAZING CONDITION. PLEASE KEEP WATCHING MY AUCTIONS OVER THE NEXT FEW MONTHS AS I HAVE A FEW NEVER SEEN AND RARELY SEEN IN DEMAND ITEMS TO COME UP FOR SALE!!! 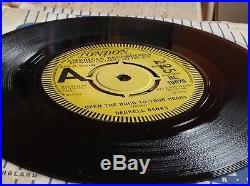 RARE ORIGINAL UK DEMO PROMO PRESSING – HOLY GRAIL NORTHERN SOUL / MOD / LONDON RECORDS single by DARRELL BANKS from 1966, ORIGINAL UK PROMO PRESSING IN GREAT CONDITION!! 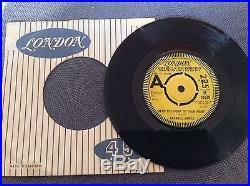 What can you say about this HOLY GRAIL NORTHERN SOUL MONSTER, probably the RAREST and MOST in demand of the UK NORTHERN SOUL singles, the single was withdrawn because LONDON RECORDS discovered they don t own the rights for this single and eventually it came out on the EMI / STATESIDE label later in 1966!! This is the one everyone is after in its glorious ORIGINAL DEMO PROMO PRESSING format!! It was comped on the: NORTHERN SOUL: THE COLLECTION and THE TWISTED WHEEL STORY and MOVE IN UP, NORTHERN SOUL compilations!! THIS IS THE ORIGINAL 1966 DEMO PRESSING with the SERATED EDGES and matrix numbers are. SIDE A: 45-MSC-7586-1C (machine stamped), SIDE B: 45-MSC-7587-1C (machine stamped)!! MOST OF THESE SINGLES COME IN NEAR MINT / PLAYED ONCE CONDITION, WITH THEIR ORIGINAL COMPANY SLEEVE FROM THE RECORD SHOP BACK IN THE DAY (you can see the correct catalogue number written in the corner of the COMPANY SLEEVE as was done by the record shop back then) AMAZING CONDITION!! The tracks are: OPEN THE DOOR TO YOUR HEART / OUR LOVE. 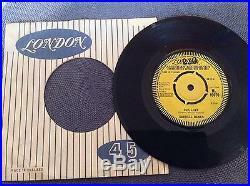 The single came out on LONDON AMERICAN RECORDS catalogue number HL 10070. The condition of the vinyl is in VG+++/ EX condition non feelable scuffs and marks only, plays MUCH better + promo number stamped on both labels!!! + ORIGINAL COMPANY SLEEVE!! ALL PARCELS TO ITALY WILL REQUIRE REGISTERED / INSURED POST!! There is NO reserve on this item considering it’s rarity. All records are sent in hard cardboard boxes with extra padding, and VINYL is taken out of the PICTURE SLEEVE!!! 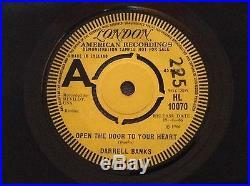 The item “DARRELL BANKS -OPEN THE DOOR TO YOUR HEART ORIGINAL UK 1966 DEMO PROMO LONDON EX” is in sale since Thursday, November 24, 2016. 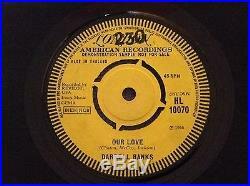 This item is in the category “Music\Records\7” Singles\R&B/ Soul\Northern Soul”. The seller is “modboy1″ and is located in LONDON. This item can be shipped worldwide.